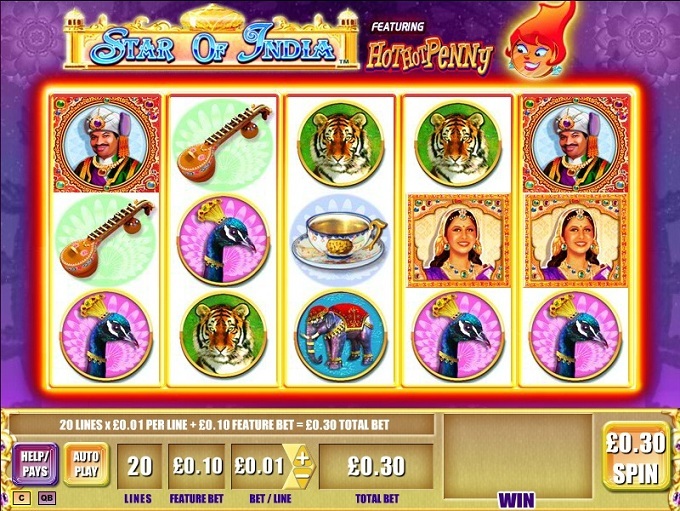 Star of India seems to be an attractive slot machine, with a theme inspired by India and its more beautiful parts. With tea sets, music instruments, elephants, peacocks and Indians dressed in traditional clothing, it ends up being a beautiful slot machine and a way to see what this big country has to offer in terms of traditions. It comes from WMS, a slot developer that is not very well known, but which seems to have done a decent job in this case. 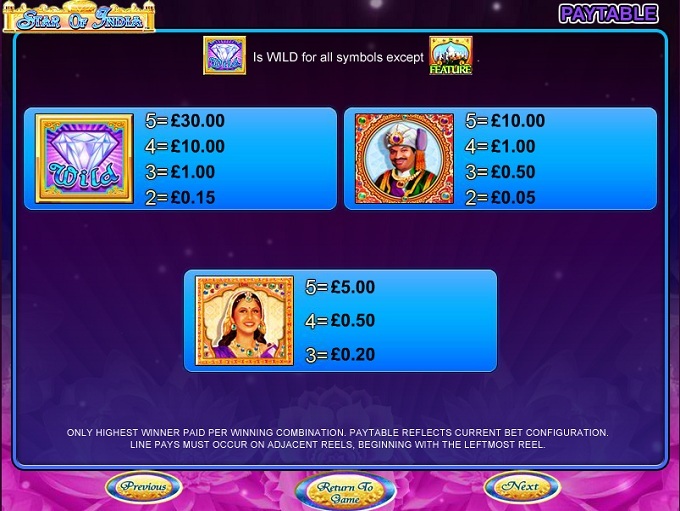 On the 20 paylines of Star of India you will get wild symbols and scatters as symbols, plus free spins which can be triggered along the way, and with 3x multipliers for the wins. A top prize of $15,000 is possible. While playing Star of India, you can expect to come across wild symbols, scatters and features with free spins and multipliers which will triple payouts. The Wild Diamond symbol will surely be a favorite of yours. It’s not only the wild feature which brings you more payouts as you continue to play, but also the one that gives you the top jackpot, with 3,000 coins being up for grabs if enough of them take over a payline for themselves. Being a wild, it can’t substitute for the scatter symbol, and that shouldn’t come as a surprise if you’ve played slot machines before. 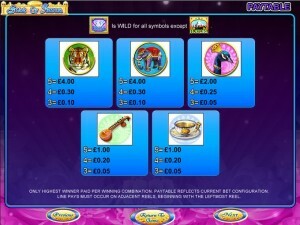 The game has a scatter symbol as well, and its presence will signal the start of the free spins, provided that enough of the symbols are in place. The scatter symbol has the image of the Taj Mahal on it and it is required on two or more reels to give you prizes and on three or more to trigger the spins. If you get the free spins, there will be 8 of them in the feature, and for their duration the payouts which come from regular combinations will be tripled in value. Unfortunately, this doesn’t apply to the top jackpot which is offered by the wild. 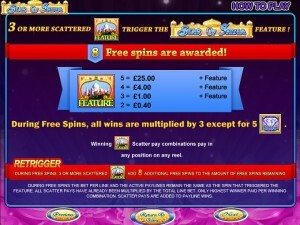 To get an extra 8 free spins, you need another 3 or more scatters on the reels of the game. 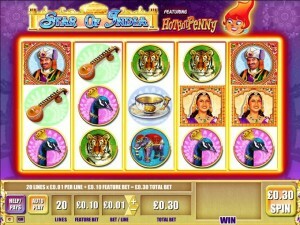 The bets which Star of India accepts use 20 coins for the lines and another 10 coins for the extra feature. The 30 coins have a value of $0.30 to $150, the denominations being between $0.01 and $5. If you get the best prize available, it awards 3,000 coins and their value will be up to $15,000. Though an incredibly crowded place, which sometimes might mean a lot of dirt as well out in the real world, if you look at just the traditions and incredible amount of detail which can go into an object made by an Indian builder, you’re going to be stunned at the outcome. Star of India manages to offer a beautiful design, taking advantage of the best things that the Indian culture has to offer. Symbols: Diamond (wild, 3,000 coins), Taj Mahal (scatter, 125x total bet), Indian Man (1,000 coins), Indian Woman (500 coins), Tiger (400 coins), Elephant (400 coins), Peacock (200 coins), Guitar (100 coins) and Tea Cup (100 coins). The beauty of this country should make it easy for anyone to give it a chance, and it does get plenty of help from its prizes and features as well. 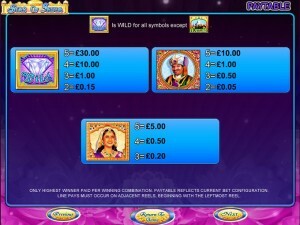 Star of India can be found at any WMS casino, where you get a chance to play it for real money or in free mode.